In the PYP, the units of inquiry create the entire school’s Programme of Inquiry (POI). When planning for learning, all teachers collaboratively look for connections between the elements of each unit and the “specialist subjects.” When looking for links, we focus on students experiencing real and authentic connections that bridge their understanding to experience how learning crosses boundaries and disciplines. In the unit flyers, parents will notice when specialist subjects state that they are “integrating” with the homeroom unit. This means that students are inquiring into the same unit through the lens of a different subject when they visit the specialist teacher to broaden their understanding and make connections across disciplines. Here are a few examples of how PE and Visual Art integrated recently in Unit 2. For their unit on How we express ourselves, PYP 2 inquired into how people have interacted and communicated with each other using Art throughout the ages. 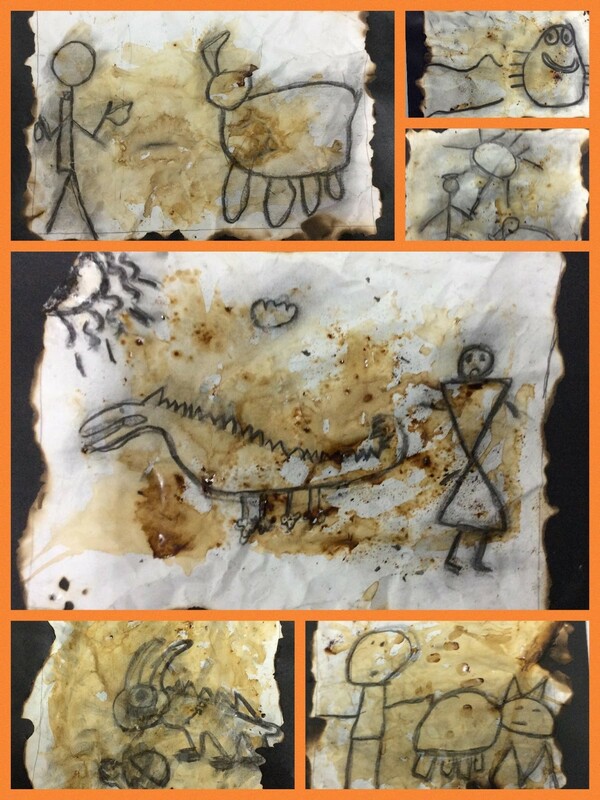 This linked to their previous unit on communication with strong connections being made to using non-verbal communication as a means of self expression. The Visual Art classes focused on the concepts of connection and perspective. Students were exposed to artworks over the ages, with an emphasis on content, style and how tools and materials have changed over time. They produced their own artworks s in the style of different time periods they were studying. The cave paintings above are one example of their work with charcoal – a medium that most of them explored and enjoyed for the first time. 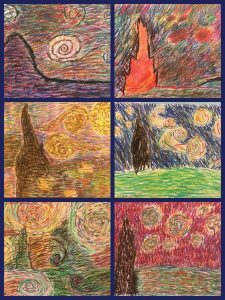 Taking their inquiry further, they then studied the works of Vincent Van Gogh and created their own versions of his famous Starry Starry Night. The students will continue their inquiry by looking at another artist in time and how he communicates a message through the works of Piet Mondrian. 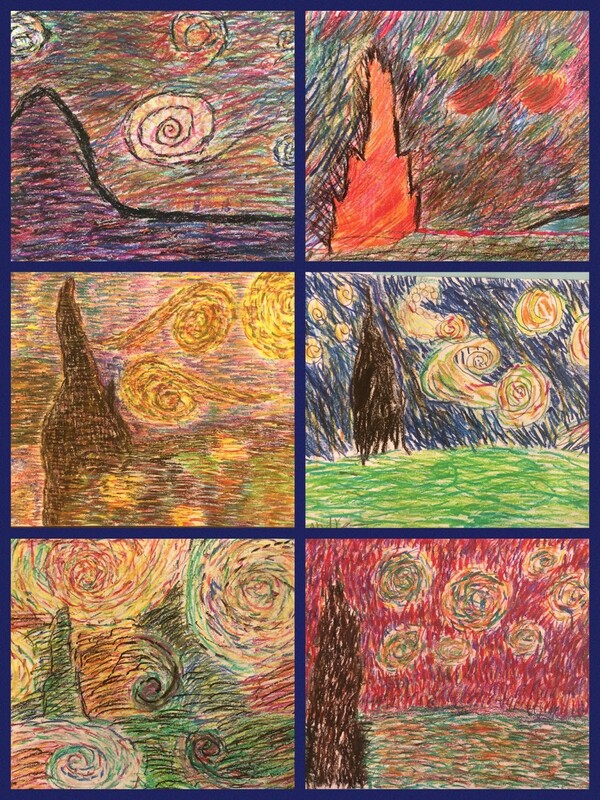 Students will be creating their own artwork in his style. 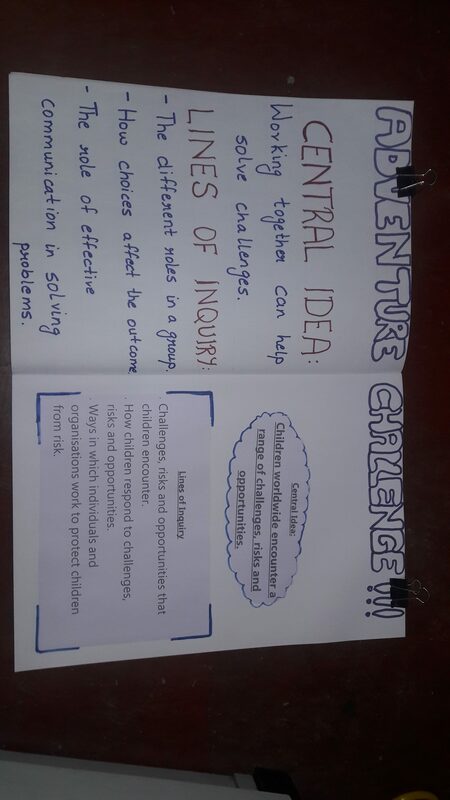 In Unit 2, PYP 4 students inquired into peace and conflict resolution as part of the transdisciplinary theme “Sharing the Planet” through Adventure Challenge in PSPE. In PE lessons, we focused on the concepts of peace and conflict through different group challenges. 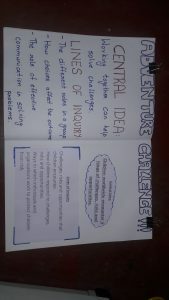 The students were put in situations of conflict each lesson and attempted to resolve these conflicts in a group setting. 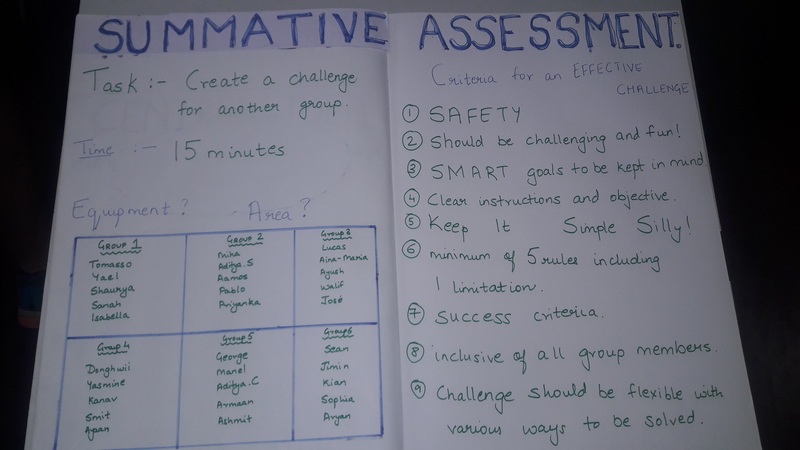 An effective tool for integration was the big book which was used as a display board to showcase our central idea and criteria for the summative assessment task. The students were able to see the homeroom Central Idea as well as the PE Central Idea side by side and make connections between the two. 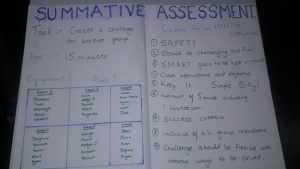 Using the big book made it easier for the students to discuss the criteria for the Summative Assessment Task as a class and display it immediately, as well as refer to it later. As this unit requires students to work in groups, we were also able to create the groups and display this on the big book. Students gained a deeper understanding of the concepts peace and conflict as they experienced it in a PE setting as well as through their inquiry in the homeroom.